We recently shared the announcement that Instagram added polls into the Stories feature. Well now Insta’s owner, Facebook, is adding an element to its polls that is sure to boost engagement and generate more awareness for your residence’s presence on the social media platform. 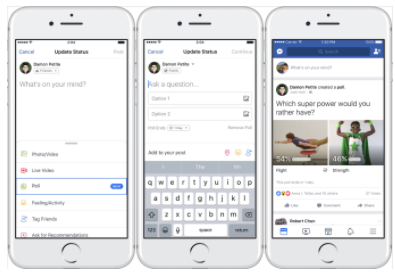 After testing the feature earlier this year, Facebook just rolled out the option to use photos and GIFs as answers to poll questions. The polling feature is now available on all personal and business pages, and through mobile apps on Android and iOS. Creating a poll is simple. Just compose a status on your property’s Facebook page, select Polls, compose your question and two answers. You can then decide to upload images or choose from a library of GIFs, and attach links to answers. Then you’ll choose an expiration date for your polls and post. You can set a time limit of a day, a week, or just leave it running indefinitely. If decide to set an expiration date, it’s visible to all users and can add an element of urgency, which can be beneficial for increased engagement or for contests. Plus, everyone who casts a vote can see the results. Similar to the new feature on Instagram, answers aren’t anonymous and and everyone can see who submits an answer to your poll. Polls provide an interactive, engaging way to help your property stand out in otherwise crowded news feeds, while also building genuine connections with your residents or prospective residents. To help you get started, we pulled together five suggestions for poll topics that you can use to increase engagement on your property’s Facebook page and test out the new answer options. Get feedback, instantly. Looking to add a new amenity to your property? Or maybe you’re going to host a band or live event. Conduct a live poll on your page to get feedback from both current and prospective residents about the options you and your team are considering. Come up with your next party theme. 80s or 90s night, that’s the question. If your team is gearing up for an on-property party, put two different party themes up on the poll to see which one gathers the most interest. Introduce residents to the local scene. Your property is surrounded by plenty of happening spots such as boutiques and restaurants. Ask your followers which one of the two new restaurants is their favorite. Maybe even offer a giftcard to the winning location to one of the poll participants as a way to increase engagement. Decor done their way. Whether it’s for the holidays or an upcoming season, your residents will feel really valued to give feedback on the chosen decor inside and outside your property. Maybe you choose a color or a theme for the decor and have your followers provider feedback. Cutest pet awards. Pet-friendly? Use polls as a fun way to show off your property’s cutest furry friends. Host a friendly competition on your page where the winner wins a gift basket with doggy treats or a day at the doggy spa!